Thiel: 10-6? So he’s saying there’s a chance . 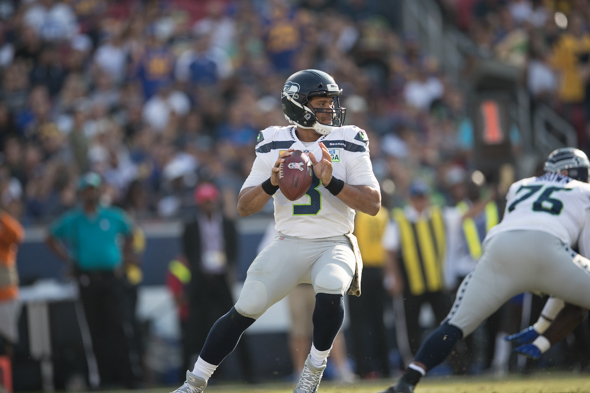 . .
Let’s take a metaphorical ride with Russell Wilson, and embrace his optimism. There’s a way to get to 10-6 and make the playoffs. Here’s how. What if the Seahawks are good? As in, nearly-run-the-table good. As in, winning six of their final seven, starting with the Packers, to finish 10-6 and qualify for the playoffs. Not saying that will happen. But Russell Wilson almost did Tuesday. Of course, we have learned to expect nothing less from Wilson, whose optimism is as relentless as the Borg. So let’s run with this for a moment. Let yourself be assimilated by Wilson. We promise to transport you back. “I think there’s two things there. First, I think it goes back to finishing right. I think that if we can make one or two plays here and there across the board — whether it’s offense, defense, special teams — we can turn that around really easily. Please hold your cynicism. Remember, we’re being assimilated here. The Seahawks’ losses have been by three, seven, two, eight and five points. They have established that they are capable in all phases, as well as periodically inefficient. In each defeat, they have been within a successful final possession of a win or a tie. They are accomplishing part of what they set out to do with the roster and staff turnover. The 273 yards on the ground Sunday against the Rams was not only the most in four years and made them the No. 1 rushing team in the NFL, it was done with road-grader RG D.J. Fluker on the sidelines. His replacement, the magnum-obscure Jordan Simmons, played his first pro game against planet-eating DT Aaron Donald and spent no time on a gurney. Simmons’ ability to step in and contribute above his pay grade on a first try suggests a system success. Had Wilson merely taken a step forward in the pocket to avoid the fourth-quarter, strip-sack fumble and subsequent short-field TD by the Rams, the outcome may have been different, and Simmons would be the leader in the clubhouse for Grand Marshal of the Seafair Torchlight Parade. Carroll’s system almost always shows progress with young starters as the seasons enter November and December. The anomaly was the past December, when they lost three of five. Even then, they beat the eventual world champion Eagles — with a healthy Carson Wentz — in a wire-to-wire, 24-10 decision. If form prevails over the final regular-season games and the young secondary improves to a level approaching the NFL average, the defense has a chance to keep the Seahawks from needing a panicky rescue drive to save every game. “We’ve been so good at those (rally) games for such a long time that the fact that it’s not happening is a little bit unusual,” Carroll said. “I’m disappointed because we’ve been able to always feel like we’re going to win those games, and do it. As Wilson looks at his team and the calendar, he thinks it’s time to show it. Green Bay home 4-4-1, Carolina away 6-3, San Francisco home and away 2-8, Minnesota home 5-3-1, Kansas City home 9-1, Arizona home 2-7. Playing seven games at a time, it’s reasonable to see three wins from the 49ers and Cardinals, a loss to the Panthers, and toss-ups with the Packers and Vikings. The Chiefs are a wild card, because they could clinch everything in the AFC by Dec. 23 and rest a few starters. But since all three are at the Clink, and the Packers had to fly Tuesday night after a Sunday game, let’s say that, for assimilation’s sake, the edge goes to Seattle. But as promised above, we must transport you back from assimilation. Something unforeseeable will go haywire, klaxons will sound and the lifeboats will be deployed. A six-out-of-seven finish is a foolish aspiration. Unless 2015 is considered. The Seahawks were also 4-5, then won six of the final seven to make the playoffs. If Seattle makes the playoffs again after starting 4-5, that qualifies as a habit. And we shall all be assimilated. Now you’re talking sense. I see it. I believe! The fact is that the Hawks have demonstrated repeatedly that they can go toe to toe with any team. I attribute all the close losses to regression to the mean (after winning so many close games in past seasons). Regression complete. And all the young players keep getting better. When you think about it, Russ’s championship talk is entirely rational. Bring it on. Resistance is futile! You are assimilated. Your Borg eyepiece is in the mail. If you believe this story I have a bridge to sell you. Deception Bridge. I’ll sell you back a mountain in SE Alaska: Mt. Fairweather. Hm, a bridge is a bridge and a mountain is a mountain, a fair trade. Speaking as somewhat of an incurable optimist, I like your thought process, Art. Would that it could come to pass. The first step, of course, is to come up with a win tomorrow night. I note that virtually of the “experts” are predicting a close game, with a possible lean in favor of the Hawks. Here’s hoping. Here’s to hoping it’s not another injury-riddled poopfest like last year. Packers practiced Tuesday at Memorial Stadium. It’s a bad trip for them already. Intriguing and a valid argument. This team is coming together similarly but different than the ‘13 team. The young overreacting defense came first then settled in, tempered by experience. While the defense stabilized, the offense along with a young Russell Wilson, started to establish themselves, punishing with the Beast. Now the offense is just a bit ahead of the defense in their progress, and while they still have a ways to grow, especially the secondary, they are indeed close in each game. If the young D can settle in and continue to grow on the mental recognition side, while the offense gets more and more comfortable in execution, there will be fewer errors and a chance to turn close games into more favorable margins. This team is on the rise. Six out of the last seven? It’s possible. But still there are glaring weaknesses: lack of multiple pass rushers, and a dominant receiver that can get immediate separation. If Baldwin’s knee heals, he’d be that receiver. Big if. (Post GB) I guess he was! Still, the quickest throw was to Ed Dickson. We need more of that and less Russ waiting to throw. Okay, if he makes those throws and the balls get intercepted, what will be the criticism then? Rodgers does the same damn things Wilson does and yet he gets credited for being the best and when he chokes, everyone else is blamed. Leave Wilson alone because without Wilson, Seattle is irrelevant just like the Sonics were before they left for OKC. Point is not against Russell for not throwing, it’s getting someone open quickly. I’m a Russ advocate too! In 2012, that young QB, who carried that team to wins over Chicago, Buffalo, New England, NY Jets and Minnesota, had them 34 seconds from the NFC title game when the supposedly great defense collapsed in just 25 seconds in Atlanta. He carried them in that Atlanta loss and since that day, he’s been the leader of this franchise, yet, because of jealousy among teammates, he’s been so damn disrespected. I recommend getting and wearing an “In Russell We Trust” t-shirt. Go Russell – GO HAWKS! Kansas City won’t win because the old curse from the AFC days still carries into today. No team among both the Chiefs and Seahawks will win on the road with a few exceptions. Not familiar with that curse. And a curse isn’t a curse if it has exceptions. WOW – If any sentence sums up RW and his winning mentality, this is it. Impressive, and so true. I have seen players quoted that in those 4th quarter huddles in comebacks, RW is so matter of fact and positive, the players can’t help but believe and follow the guy. His late-game record speaks volumes. After Wilson single handedly had them 34 seconds away from the NFC title game as a rookie, he sat on the bench and watched RICHARD SHERMAN and that defesne choke in just 25 seconds to send Atlanta to San Francisco for the conference title game. What did Wilson do after that game? He didn’t throw Sherman or his defense under the bus, (like they’ve done to him quite often) he told reporters “I’m excited for next season because we’re going to the Super Bowl”. Well everyone knows what happened in 2013. In 2015 when the defense blew that lead at home to Arizona and lost 39-32, EVERYONE was calling for Wilson to be benched after the team fell to 4-5. He just said “I got to play better”. The next 7 games, Wilson threw 24 TDs with 1 INT, rushed for another TD, set numerous NFL records, beat division leading Pittsburgh, Minnesota and Arizona as Seatte went 6-1, made the playoffs and again beat division winning Minnesota on tha road. He led the NFL in passing that year. Wilson did those things despite losing his Pro Bowl TE to a season ending injury, losing the NFL’s yards per carry leader to a season ending injury and having his Pro Bowl RB missing many games while quitting on the team when they traveled to cold Minnesota for a playoff game. So in 2018, if Wilson says THIS TEAM is championship caliber, LISTEN TO HIM because in 2012, THAT TEAM was not supposed to compete for a conference title, THAT 2015 team was supposed to be dead and THIS team was supposed to be Buffalo and was supposed to be behind San Francisco and possibly Arizona in the NFC West when in reality, the Rams don’t want them in the playoffs this year because they may have to face them a 3rd time. LISTEN to Russell Wilson and stop doubting what he says.